Started in 2006 and completed in 2010, this building stands at 82 stories high. Architects Jim Lowenberg and Jeanne Gang created a piece of architecture that is more than just a building and is more like a sculpture. 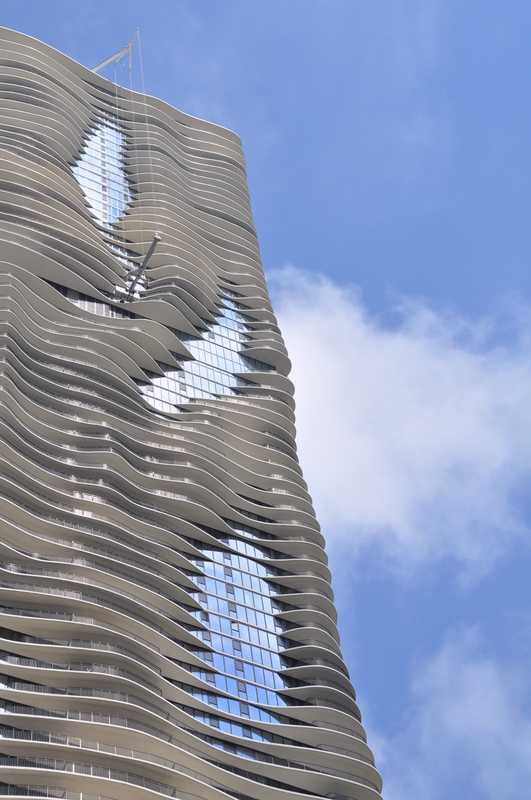 The name “Aqua” is in keeping with the nautical theme most of the buildings in the Lakeshore East development have: The Tides, The Shoreham, The Regatta, etc… But while those were conventional skyscrapers, Aqua is special. At its heart it is the standard glass box we haven’t seen before. But protruding from its surface are undulating concrete balconies resembling ripples or waves. This is an appropriate homage considering the building&apos;s location near both Lake Michigan and the Chicago River. But the ripples are not without challenge. Much like each wave in the lake, each floor plate in Aqua is unique, thus construction is unusually complicated. And for homeowners, not all units are equal. While some people may have a balcony up to 12 feet wide, others will be measuring theirs with a ruler rather than a yardstick. This building was also one of the filming locations of the movie Transformers 3. For more information on the building, check out this site. This entry was posted in Architecture, Chicago, Life, Movie locations. Bookmark the permalink.